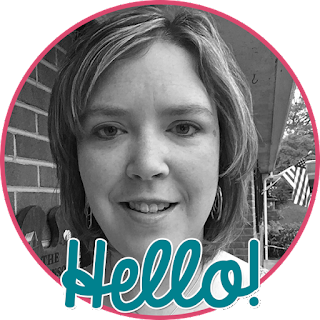 We all know the importance of being organized in our classrooms and everyone's idea of organized is a little different, but it works for YOU! I've taken some pictures of how I stay organized in my classroom. This first picture is of some of my bookcases. 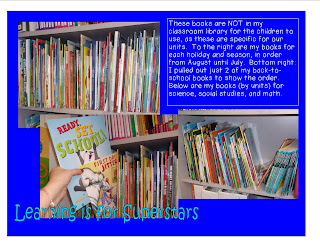 These books are the ones that I have carefully, thoughtfully, and purposefully purchased for specific lessons, units of study in science social studies, and math, or for various holidays. 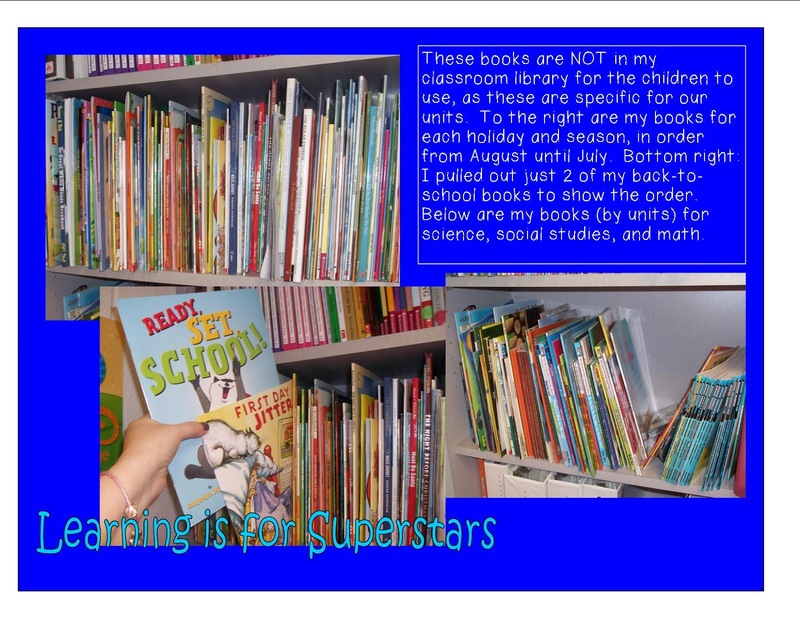 The books for holidays are put in order by the school year - I've pulled two of them out to show you their spot on the shelf, while the other books are sorted by topic on other shelves. Here are some of my binders. Everything I use are in binders, and pictured here are some of my language arts binders. (I'm color coding them by subject area.) 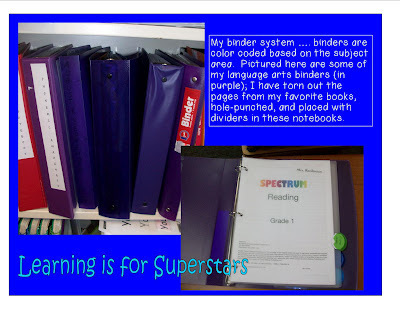 I have torn out the pages of some of my favorite resource books, hole-punched them, and placed the pages behind dividers in some of these binders, while others have reading units and language arts activities. This picture shows my unit binders (all are in white). 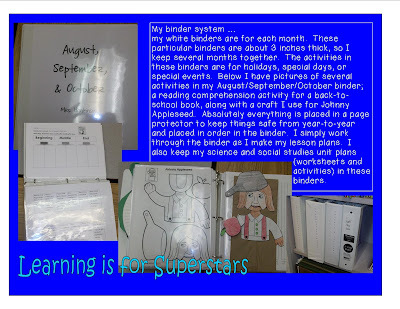 These binders have activities that are designed for a specific month or are part of my science and social studies units. Everything in these binders are in page protectors (I should have stock in them!) and in a particular order, so that I work through my binder throughout the month (or months). 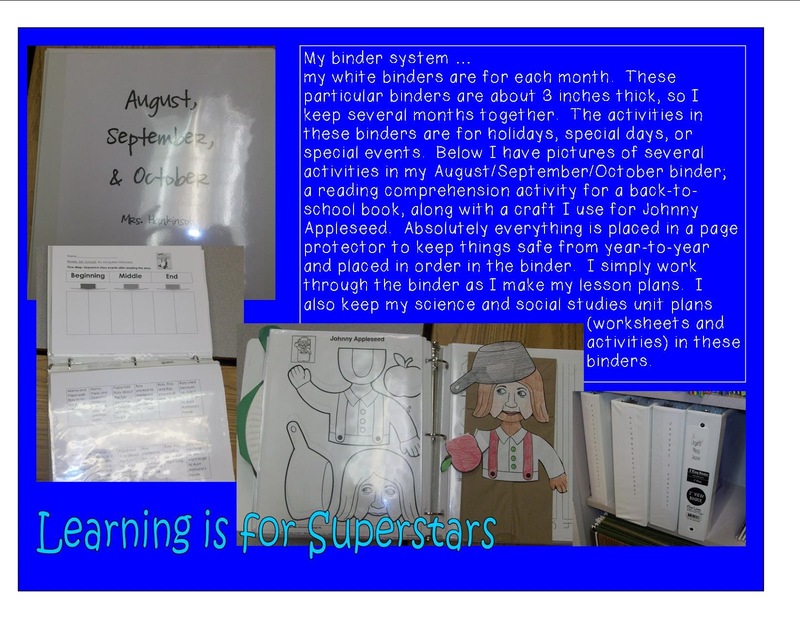 In my picture I have the activities that I use for Ready, Set, School (that we'll do when school begins), along with my Johnny Appleseed puppet for my apple unit in September. 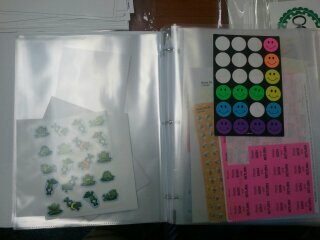 These next two pictures show my collection of stickers and how they are also organized in page protectors in binders. I saw this somewhere and can't remember where. If it was you, please let me know so I can give you credit! 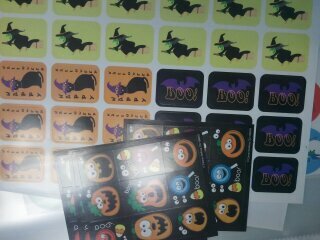 The stickers are sorted by holiday (Halloween here) and even by size and style (see below). 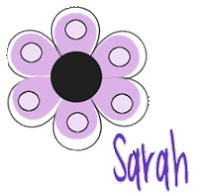 I am amazed how quickly I can find the perfect sticker! Want to link up? Post your ideas (the actual post, not your blog) below. I hope you get some fabulous ideas! You inspire me to be more organized!! That is exactly how I would love to organize my units. I get overwhelmed with it all though & it never ends up like that. I just need to stick with it! Giveaway and freebies and ... giveaway?